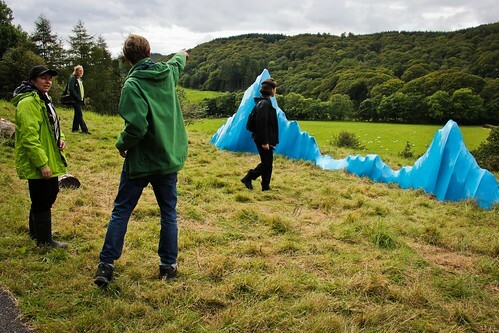 Peak Simulator was a new sculptural installation from Matthew Plummer Fernandez that juxtaposed computer-generated landscape over the ‘natural’ landscape. In the early 1980’s the film industry began to explore computer generated imagery developed by computer scientists. These computational techniques were based on simple recursive equations that generated complexity with minimal effort. The first film to adopt this strategy was Star Trek 2: The Wrath of Khan in 1986 by Loren Carpenter, who later went on to found Pixar studios. For AND15, Plummer created a physical manifestation of the algorithm within Grizedale Forest, which so many computer generated landscapes have been based on in the film and gaming industry.